Gifu prefecture（岐阜）in the middle of Honshu（本州）is one of my favorite prefectures. It is the prefecture of Shirakawa-go（白川郷）and Hida-Takayama（飛騨高山）, which had gotten touristy in recent years, and also Gero Onsen（下呂温泉）and Gujo-Hachiman（郡上八幡）town. Met a few really nice locals in Gifu, which added to my good impression of the place. The key attractions in Gifu are convenient to go via bus or train from Nagoya（名古屋）. 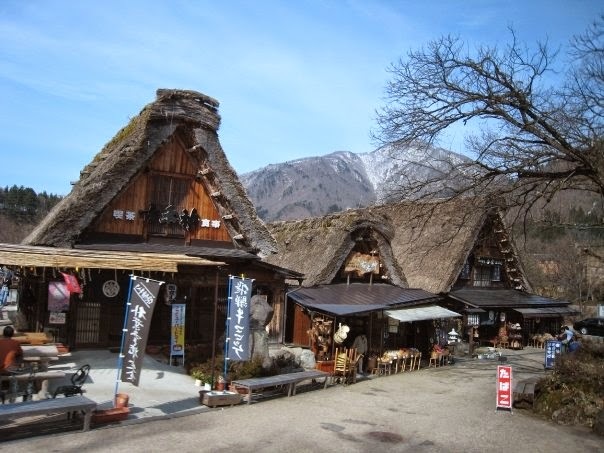 UNESCO World Heritage Site-- Shirakawa-go, is a village with thatched roof（合掌造り）farmhouses. Ogimachi（荻町）is the largest village and main attraction in the region. I went to Shirakawa-go twice, in spring and winter. Both were short day trips without exploring the houses in detail. Though it was already enough to make me attracted to such villages and start visiting other similar areas like Miyama（美山）in Kyoto, Hida no Sato（飛騨の里）in Takayama, Gassho mura（合掌村）in Gero, and Iyashi no Sato in Yamanashi（山梨）. December onwards is a good time to visit Shirakawa-go as it snows often. The snowscape is really magnificent! There is also illumination on some weekends in January & February. It would be fun to stay overnight at the farmhouses, though reservation has to be made early as they are very popular with foreign tourists these days. Hida-Takayama is a nicely-preserved old town dating from the Edo period, somewhat like a bigger version of the Gion District in Kyoto. Really really like this place as layout is simple yet there are quite many things to see. There are rows of shops selling pretty handicrafts and local sake, as well as restaurants selling Hida Beef cuisines. There are also morning markets, museums, shrines, heritage houses and a festival float exhibition hall. I actually went there thrice, all day-trips. Although I managed to explore the town in detail during the 2nd time, went there again for the Takayama Festival in spring. It is ranked as 1 of Japan's 3 most beautiful festivals, together with Kyoto's Gion Matsuri and Saitama's Chichibu Yomatsuri. Though when I went there, the night parade was cancelled due to the rain, and the floats could only be seen in their respective storehouses. Apparently, this is really common as it often rains in spring. Still, there were MANY visitors, half were locals and half were foreigners. This festival is also held in autumn. Hida Folk Village is a short bus ride away. For people who have no time for Shirakawa-go but interested to have a feel of such village, Hida Folk Village is an alternative option. It is an open-air museum with 30 traditional houses from the Hida region. In Spring 2015, visited Gero Onsen, my last of top 10 hot springs in Japan (according to 2014's ranking). The town reminds me of Arima Onsen. Stayed in Ryokan Masuya（旅館ますや）, around 13000 yen for 1 night (Hida beef steak plan on peak period), and they are opened to solo travellers :) Amenities was average, but food and service was AWESOME. The main female staff was really nice. For example, I was coughing quite badly, so she specially brought over a humidifier and said that I could contact them anytime if my condition worsen later, no matter how late in the night. I don't recall any ryokans I stayed before has good service to this extent. The Hida beef steak in the dinner set was super delicious too, not losing out to Kobe/Tajima ones at all. Visited Gassho mura the next day, and had fun checking out the traditional thatched roof houses and chatting with locals too! Gifu is also known for cormorant fishing on Nagara River. Definitely a prefecture worth visiting and one that I'd keep going back!